The retro gaming project has been on a bit of a hiatus…work, life and other stuff getting in the way. And to be honest, I was starting to question the value of my approach. My implementation of the Mechanics/Dynamics/Aesthetics approach had twisted into a more lazy and generic (ie poor) game review approach instead. However, now that I’ve finished the process of publishing my own game Gravigation on Google Play Store, I’m in need of some inspiration for my next outing. So I’m going to try and get back into it. In the meantime I’ve also become less critical of my approach. I’ve stared to watch Good Game Pocket religiously and see some parallels between my approach and that of @NichBoy (obviously his is much more refined and a hell of a lot more humorous and entertaining). So, next cab off the rank is Sonic the Hedgehog. Once again, broken record time, the time available to really learn all the ins and outs of Sonic was hamstrung by available gaming time and the absence of game saves, and the fact that its quite a tricky little game. 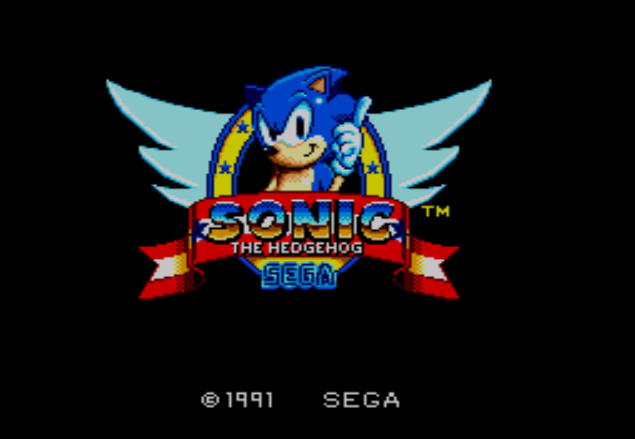 Fundamentally, Sonic the Hedgehog mirrors a lot of the core mechanics and dynamics of Super Mario Bros and the standard platforming genre, but with some nice twists and additions. So I’ll just highlight some of the obvious differences that were incorporated to make the gameplay different / better / more fun. If memory serves – I think Sonic is the first game that I have played in this Project that has an “up counting” clock. So there is no “count down” pressure being applied to keep you progressing forward. In fact, unlike SMB, the player can traverse backwards through the level as far as they they choose to do so (with a caveat I’ll explain below) and take as long as they want. However, there are several mechanics employed which do support / encourage a dynamic behaviour of trying to complete the level as quick as possible. 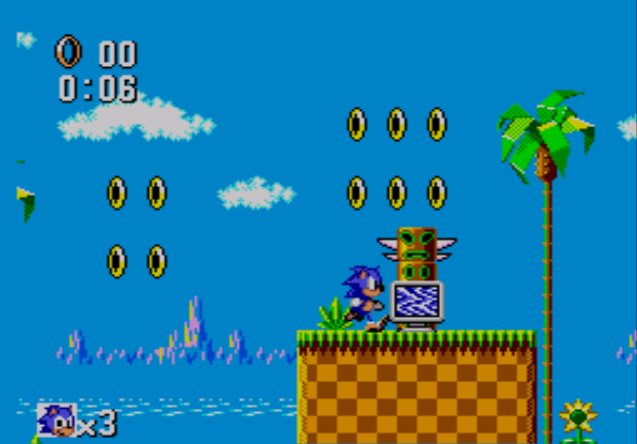 First, like SMB, the player receives score bonuses if they complete the level quickly. 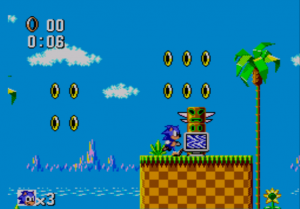 Secondly, and as a noted difference to SMB, there are several powerups located in the level (in the form of video monitors), one of which gives Sonic a pair of power-sneakers and a massive boost in speed (and therefore jumping distance etc). This means that, especially for the first level (which I had to complete several times because I am obviously a platforming quamby…ie slightly uncoordinated), you can eventually complete it about 10 seconds or so. This has obviously influenced the “speed running” dynamic behaviour for Sonic. It would be interesting to learn more about the design decisions or other reasons that drove the implementation of these mechanics that support the “speed running” dynamic. Or in fact to understand whether this was an intentional design outcome. Speed running obviously means that the gamer wouldn’t get a good appreciation for the awesomeness of the level design. However, like all games of its time, the designers were probably counting on a high degree of game replay by the gamers (ie little Johnny only got enough allowance to buy one game every few months). So they were probably figuring that the level design appreciation would come from the many play throughs that the gamer would experience before they tried their hand at completing the levels as quickly as possible. As for that caveat, it was interesting to be subjected to a mechanic, that I’ll term “forced progression”, that was introduced in the second level of the second stage. Here, the game screen slowly scrolls to the left at a steady pace. As part of this, Sonic cannot backtrack and the gamer needs to switch to a different gameplay style of having to make quicker decisions about moving forward before the “screen” forced them to. This gameplay style forced me to consider several “dynamic” approaches to the problem. I could either stay as far to the left of the screen as possible to maximise my thinking time, or I could stay closer to the right to find out quickly what the challenges ahead were. Unfortunately, I didn’t get to much time at this level to work out the best approach…in fact I never completed the level :-(. Probably one of the better design aspects to learn from Sonic is how it worked several mechanics together to build up the overall challenge. For example, the mechanic of “disappearing platforms”, where parts of a bridge would disappear once you’ve walked over them, would severely constrain your options to deal with the “forced progression” mechanism, thereby increasing the challenge. Another departure from SMB was that Sonic needed to build up a certain speed / momentum in order to jump high enough to collect some of the power-ups / rings. Whereas with Mario, provided you didn’t progress too far to the right, you could essentially collect all powerups with Mario’s standard jump. This wasn’t the case with Sonic. However, the fact that the game didn’t constraint your travel backwards through each level, if you wanted spend the time capturing all pickups (by back tracking far enough to build up speed to make higher jumps), you could. Finally, a noteworthy mechanic is the “duality of pickups”, specifically in relation to the rings. The primary purpose of collecting rings was to collect as many as possible to maximize your end of level score bonus. The rings however provided a secondary benefit of allowing you to survive getting hit by an enemy; that is you’d lose all your rings (and therefore sacrifice your bonus) but at least you’d survive and still be able to play on. This is similar but slightly different to the duality of Mario’s powerups. The power-ups (Big Mario and Fireball Mario) make it easier to get through a level and therefore enhance your score, but hitting an enemy would force Mario to retrograde to “small Mario” instead of suffering instant death. Overall, like all these retro games (except Bionic Commando), great design and great learning points to be had. Hey Nick, thanks for this article, I really enjoy reading your take on some of the retro classics. If you haven’t read ‘The Rise and Fall of SEGA’ I highly recommend it. They talk about some of the design decisions with Sonic (more-so on the Mega Drive but they also translate to the Master System release) particularly in relation to hardware constraints. The “Speed Running” mechanic was absolutely intentional. It was a way to showcase the superior clock speed of the SEGA consoles (true for both the 8 and 16 bit generations) that allowed for faster scrolling. Overall Nintendo’s consoles were more powerful in terms of number of sprites, rotation and scaling. So SEGA put the call out to developers to come up with a mascot/game that really showcased the strength of the SEGA system’s hardware. The speed of the Sonic games simply couldn’t be matched on Nintendo hardware and “speed” became the number 1 marketing silver bullet for SEGA. Definitely some great level design lessons to be learned from this game as you say! The strength of the Master System’s colour palette from and art point of view really shines through as well! Hey Adam – thanks for the extra leads, I’ll go hunt them down and keep on learning!